Hyderabad: Hyderabad Metro Rail passengers can now ride a bike on rent to reach their work places or home from Miyapur Metro Station. Hyderabad Metro Rail Limited in association with Wickedride.com, a private company launched the bike rental scheme at Miyapur station with 20 bikes. Users will have to pay Rs 4 per km as charges for riding the bike and there are no waiting charges. Users do not have to worry about fuel as the company provides the fuel and calculates the fares as per the Odometer reading on the bikes. These vehicles will be both - with gears and gearless - for the convenience of people. The idea is to extend last mile connectivity to Metro passengers. Soon after alighting at Miyapur, a passenger can ride a bike to office or home and get back the vehicle, said HMRL Managing Director NVS Reddy. Initially, it was being launched at Miyapur station and the company plans to extend the services at other stations on the Ameerpet route. It was also planning to launch electric bicycles for cycling enthusiasts, he said while addressing media persons here on Wednesday. Briefing about the service, Wickedride.com vice-president Shamanth H said the service was operational in Bengaluru with about 3,800 bikes at 30 Metro Stations. "The response has been phenomenal and we expect Hyderabadis will also ride the bikes on rent," he said. Users have to register their names either online or offline and if there is any breakdown, they can contact the call centre, he added. 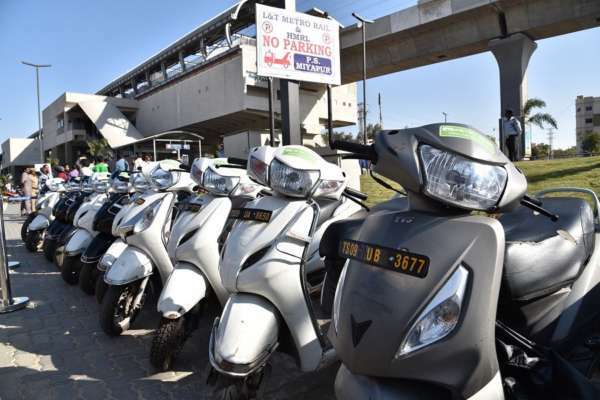 On the last mile connectivity measures, Mr Reddy said there were plans to launch electric vehicles. A few companies have evinced interest and after the Telangana government introduces the Electric Vehicles Policy, things would be taken forward, he said. Instructions have also been issued to the TSRTC to operate more buses than the 56 buses being operated on different routes. Hyderabad Bicycling Club would also be formally launching its cycles shortly, he added.